Have you ever wanted to visit a fortuneteller and wondered if she was legit or fake? It is like any other profession. Some are better than others are. Some are real and some will scam you, just like the other profession. All you need do is make a little research and once you find that person then you need to cooperate. Did you know you could affect your reading too? It is how you regard the experience. If you go in all giggly about it, then you won’t be able to ask about real issues. Every one of us has some natural intuition. It’s that gut feeling that warns you not to trust someone or avoid going down a dark alley. Sometimes it seems like common sense, but other times there is no explanation. I’ve experienced many different fortunetellers and most of them were authentic. My first visit occurred when my failure to get into a movie premiere left me waiting for the next show. I decided to see a palm reader next door. She told me I was between two men a dark one and a blonde one. My boyfriend was the dark one, but the blonde one intrigued me. I paid the woman, slipped out through the curtains, but didn’t leave. I eavesdropped on the next reading and discovered the woman had the same fortune. Sometimes people without any real talent for the business will tell people what they want to hear. Most of us want to hear about love, fame and wealth. Walking the neighborhood almost a dozen years later, I stumbled across a Tarot reader and decided to try again. 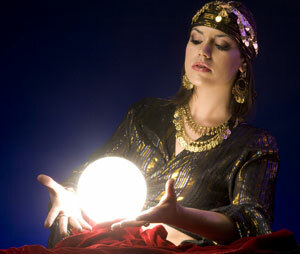 The skinny man dressed all in black did not fit my view of what a fortuneteller should look like. He chain-smoked all through the session too. I left frustrated at the reading. He’d told me I’d find love despite the wedding ring on my hand. There was also mention of returning to school to get a job, but I already had my degree and a job. More than a year later, I was out of work and divorced. I did have to go back to school and eventually fell in love. The fortune I dismissed was actually mine. Recently, I visited a psyche in a resort town not expecting too much. I’d get as much use out of the visit as the fudge sold at the half dozen stores surrounding her. As usual, I didn’t give any clues or hints to assist the reading, but I did shuffle the cards leaving my essence on them. I sat in amazement as I heard my current life told from my children, marriages, career choices and health. The psychic even told me the entire plot of a book that was only in the concept stage. As for the questions I had, she answered them too. Some people put out glowing palm signs to make money, but have no real talent. How do you differentiate between authentic and posers? Your less talented individuals will look for outward signs. One palm reader told my husband that he was very athletic and played football as a kid based on his current build. Actually, he never played football. This type of comment would be spot on for about 65% of the male population. Your own intuition will assist you. If you’re ill at ease, don’t do it. If the reader tries to coerce you into a visit, move on and find someone else. A truly talented individual already knows if you’re coming in. Recommendations are always a good way to pick a reader. People will talk about a reader whose predictions proved true. The majority of the fortunetellers are gifted. They want to use their talent to help others. If information in the reading upsets you, you’re free to reject it. Often armed with foreknowledge you can change your present and your future. How you choose to react to reading is your choice.